When someone talks about undertaking serious historical research what comes to mind? Perhaps you conjure up an image of a dusty archives room and leaning towers of paper. Census data, photographs, journals, correspondence, business records, and many other traditional archival materials may come to mind as potential sources. Did the phrase historical research make you think of artifacts? No? Not surprising, artifacts are often overlooked when seeking primary sources and at times are written off as museum fodder. However, a bounty of information can be gained from examining artifacts and material culture as primary sources. The examination of artifacts can reveal information about creators, technology of the period, social practices, cultural norms, customs, and other valuable historical data. These glimpses into the past can be useful for providing context to museum professionals, archaeologists, social historians, and as educational tools for students. For example, a pair of beaded moccasins, like the ones pictured above can provide information about the culture that created them, the time period, hunting methods, and First Nation-Settler relations. 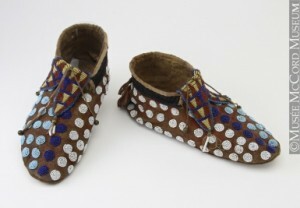 The type of glass and brass beads used in these moccasins helps date the item. Prior to European contact First Nation decorative work was done primarily with porcupine and bird quills, making the presence of beads significant. The style and colours used in the bead work are typical of beading done by Northern Plains First Nations. The tanned and smoked buffalo hide used highlights one of the many animals the creators hunted during the period and gives an example of the tanning process favoured by that particular First Nation. Similarly, with specialized analysis the sinew used for stitches could also reveal information about the type of animals that were hunted in the area. The sinew can also be used for dating the artifact. Through the examination of a variety of artifacts relating to a specific time period, geographical region, or cultural group it is possible to glean information about cultural, technical, and social trends. Artifacts also transcend literacy and language barriers. This transcendence makes them ideal resources for research surrounding oral based societies and societies where little written history is available. Artifacts that are more commonly used for historical research include: craft-work, regalia, medals and awards, coinage, tools, ceramics, and household items. Artifacts with known provenance are typically the most useful. However, almost any type of artifact can be used in historical research — researchers have used items as seemingly insignificant as building materials, quilts, and bits of coloured glass to make observations about a cultural group. In addition to potential sources for research artifacts can be great educational tools. No, I’m not suggesting that museums should let a group of rowdy children handle pottery from the early 1900s. However, having an artifact show and tell session done by a museum professional can help students understand the value of material culture and provide more intrigue than pictures of artifacts. Replicas and material designated as part of an education collection can also provide a tactile dimension to history lessons. That old handcrafted broach, a relative’s Orange Lodge regalia, quilts your great grandmother made, and all kinds of items that may be stored away in your attic or basement could have the potential to provide a window into the past. Not everything has archival or historical value, however a wide range of artifacts definitely deserve a place in our approaches to historical understanding. Excellent post, Krista. Your words reminded me of one of my first moments of excitement about history that I can remember. During a school trip to the Royal Ontario Museum, the museum’s educator presented our class with a number of (replicated) artifacts. One stood out: a centuries-old pipe from England. I remember our class discussing how the pipe, used for tobacco, must have been made after European-Aboriginal contact. The fact that such a simple artifact could signify such a significant historical phenomenon has always stuck with me. I think you’re quite right that material culture can have a strong impact on how we learn and remember history!